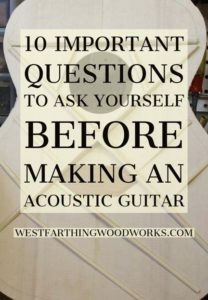 10 Important Questions to ask Yourself Before Making an Acoustic Guitar is a helpful way to get a few things sorted out before you build an acoustic guitar. If you get these questions answered beforehand, you will have a much easier build. Making a custom guitar from scratch is not a really difficult activity, it’s a really long one. The processes are about the same for making a guitar as they are for making anything else, and it’s a great learning experience. 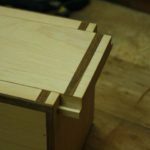 If you have some woodworking experience already, learning the new skills you need will be a very quick part of the process. It’s not that any one of the skills is really difficult, it’s just that there is a lot to do. This is a good thing believe it or not, because you only have to solve small problems when you do get stuck. You will probably need to stop more often on the first build, or as a beginner, but every time it will be for something you can figure out. Here are some questions that will help you make sense of building a steel string guitar, and make it easier for you to solve problems in the future. Enjoy. 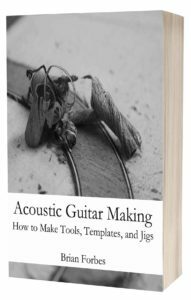 If you are a brand new guitar maker, you need a book. Even if you have already made a lot of woodworking projects before, you still need a book. This is the most efficient way to learn to make a guitar, and it will all be in one easy reference. I recommend that you buy several books at first. Pick out a couple that explain the step by step processes, and then pick out a couple that are more about theory and tips. This is a good balance, and will help you make a better guitar. The step by step books are where you will get your process information from. They can be a little heavy, and some of them will speak to you better than others, which is why you should buy two of these. 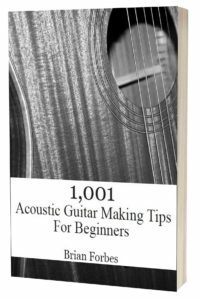 The books will deal with types of wood, wood selection, and other materials like the fret board, truss rod, and bridge. After all, not every piece of wood is created equal, and the books will help you understand musical instruments. The theory and tips books are more on the academic side of things, and they are not a set of instructions. These deal in ideas, physics, and building methods that affect certain parts of the guitar. The reading is lighter, and you can make yourself a smarter luthier. Are You Building Your Guitar From a set of Plans? 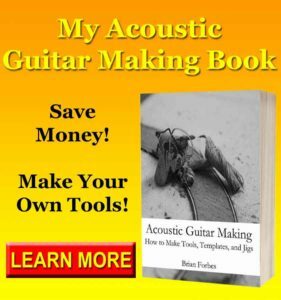 There are a lot of plans that you can buy, and they will help you make nearly any kind of guitar that you want. They are detailed, well drawn, and made to the exact specs of the guitar that they model. There are a lot of great things about guitar making plans, but in the beginning, you really need to follow the directions from a book. Plans are awesome, buy they do not some with instructions in most cases. As a beginner, the instructions are far more valuable than the plans. A set of plans without directions is really frustrating, because you need to know the steps in order to execute the plan really well. You can always do a book and a set of plans, but that can get confusing. If you must have a set of plans, make them a fun research project where you pick out a set for your second guitar. Make the first following a book with step by step instructions. While you are in the process, pick out a great set of plans and you can use that for number two. What Designs do You Love the Most? Inspiration is worth a lot. If you have a fire inside of you to make a guitar, you will be in a much better shape to actually make it. If you can channel that down to a particular design, then it can serve you even better. There are some designs that just speak to you. Some whisper, and other scream. When you find a guitar style that your soul falls in love with, you will know what I mean. If you don’t have that yet, then you just haven’t met the right guitar yet. If that’s the case, then search around for some design inspiration and think about the things that you really like in a guitar. After all, you are setting yourself up to make guitars, so after a while you will be able to make anything you want. This question will help guide you in a good direction. It will also keep you motivated. This is the difference between breezing through the hard times on a project, and getting stuck only to eventually quit the project. Where are You Going to Make Your Guitar? One of the most fundamental questions to ask yourself about building a guitar from scratch is where are you going to make your guitar? You do need a space to work, and the easier it is to remain in that space, the better. For example, if you have a shop, then you have a space that you can go in and out of pretty easily. A dedicated space is the best place to work, but you can still do really well in a space that is not as private. You might have to clean up after yourself and put things away but you can always build inside the house. A spot on a counter or a kitchen table is just fine, and there have been many dedicated luthiers who have made a guitar just like that. The only down side to not having a dedicated space is that you will have to do more set up and take down work. However, if you are determined to make a guitar, you will find a way to succeed even in the most interesting of conditions. Who is Going to Help if You Get Stuck? This question might surprise you. Most people think that they don’t know anyone who has made a guitar before. In reality, few people have. However, you can typically find someone through your friend network that can help. The only other person in the world that I have ever spent time with who makes instruments was actually a friend of my father’s friend. Three times removed, this person was still close enough to my friend circle that I was able to get a meeting. You might come up empty handed, but you need to try and find a resource to talk to. A real person is the best, and even better if you can visit them. If you have to settle for someone you can call, that will work too. In the world we live in, there are answers all around us. Even with the abundance of information ready for the taking, it’s just easier to ask someone. Spend a little time in the beginning before you start your build, and see who can help you. What Sources of Inspiration do You Have? Making a guitar is a long process. You need to find ways to keep yourself inspired and entertained until the end. In the beginning, the motivation will be easy. After a while though, it can drain fast. The amount of mistakes you make, and way you take them is one of the biggest motivation killers in guitar making. If you can work smart, take your time, and to the steps well, you will have to repeat a lot less of them. The less repeats, the faster the build moves along, and the longer your inspirational gas will take you. Even so, try and find a few places that you can visit, that will give you a boost and get you excited about the project again. Some of the best places are online. Look on Pinterest and Instagram for other people that make guitars. Try Facebook too, and any other social platform that you enjoy. Find them, and follow what they do. This will give you quick access to their pictures and posts. It’s amazing how a little motivation in the form of a picture, quote, trick, tip, to tutorial will give you more gas for the project. It works though, and it can make you want to spend more time in the shop. 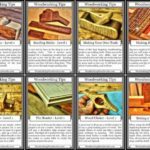 What Resources do You Have for Instruction? For beginners, a few books should be your primary source of instruction. However, there are things that you can add to the books to make them more beneficial. 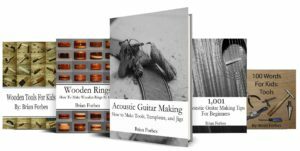 Couple them together, and you have a two direction approach to learning how to make a guitar. Since books are static, and it’s sometimes difficult to understand things from still pictures, a great counterpart to books is video. There are a lot of great places on the internet for free videos, but YouTube is the very best. Search YouTube for videos on guitar making, and prepare to be overwhelmed. There are so many videos that you could watch them daily for the rest of your life and never reach the end. You can drill them down by subject, and even learn specific techniques. Find a few people that you like to follow, and watch what they do. Browse their channels, and watch their videos. You can add this teaching to what your books teach, and together you will learn a lot at a much faster pace. Where Will You Get Your Wood? The wood for making a guitar is not as common as you would think. 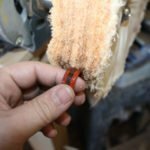 If you have the tools to make really thin pieces then you can use about anything. However, if you don’t, which most is the case for most beginners, then you need to know. Finding wood is as easy as finding a guitar making supplier. However, you also have options other than that. Even if you don’t have the tools yourself, most shops do, and they will do a little work for you for a price. 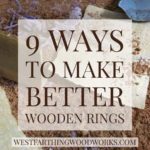 This means you can find a wood store that you like, and when you buy something from them, they can turn it into thinner pieces if you need it. This opens up more species choice, and you can also get a deal by doing things yourself. Where do You Get Your Parts and Supplies? There are a number of places to get your parts and supplies, and they are all available online with a simple search. The big two are Stewart McDonald and Luthiers Mercantile. These stores both have a lot of supplies and parts that you will need to make a guitar. It’s important to find a store that you like. Spend a little time on a few different websites for guitar making parts. Other than the big two, there are hundreds more of smaller places selling supplies as well. If you find one that you like, and that seems like a good place, then you will have an easy time getting the parts you need. Your book will tell you what you need for the most part, and all you have to do is place an order. Do You Make Everything Yourself or Order Some Things? This is a common question before making a guitar, and one that causes some argument between guitar makers. There comes a point where you can buy so many parts already made that you are doing more guitar assembly than guitar making. While it’s fine to buy things in the beginning that you cannot make yourself, make sure that you are taking steps to learn how for next time. After all, making a guitar is really about turning wood into parts, and then parts into guitars. That being said, don’t let anyone make you feel bad about making a guitar from a kit, or making a guitar with some pre-made parts. If you need a few parts to get you over the hump in the beginning, then just buy them. As you make your guitar, take some time to start figuring out what you need. If you bought a fretboard that was already made, then maybe you need to start with some jigs. 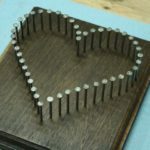 Start by making a fret slotting jig. Then, figure out how you are going to thin the wood to make fretboard blanks. If you take steps like this, the next time you will be able to make the part yourself. Over time, you will replace all the things you used to buy, and that will make you better. Don’t ever feel bad about using some pre-made parts, it’s all part of the learning process. 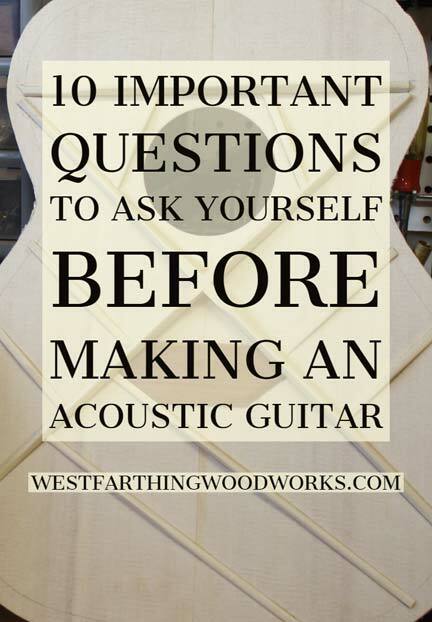 Your homework is to consider these questions before you make your fist guitar. Think about the questions, and come up with some answers. Also, think about other questions you may have, and answer those too. The more you can knock out before the actual build, the easier it will be. It will be impossible to answer every question before it actually comes up, but the more the better. It’s just easier to work things out when you have more time. If you are rushed, or you are out of time, then it can be a lot more difficult. As you learn, think about more questions and find those answers as well. Repeat this process several times, and find the answers as the questions present themselves. This will make you far more prepared to make a better guitar. You will still need to put in the time, but you will be far more prepared when you do.